Macrame is an ancient art form that has had a resurgence in the last few years adding a natural, bohemian-inspired, minimalist decor element to a home. Macrame designs are created using a knotting technique to create patterns from natural fibers like cotton, hemp, and yarn in different colors. Because macrame has gained so much popularity, there are plenty of mass-produced versions made from synthetic materials. These versions are without imperfections, however part of the beauty of this art form is the handmade element that adds to the organic, one-of-a-kind appearance. We are big fans of the macrame design and pulled 5 handmade macrame pieces that are all created with love by small makers mainly selling their pieces through Etsy using natural and organic fibers to create their made-to-order works of art. 1. INA by Wild&Feather, starting at $352 | This large, intricate piece is made from natural driftwood and mustard cotton string in Copenhagen, Denmark. We love the mustard color that adds a sophisticated yet fun pop of color to a home. 2. Landscape by Urban Jungle Design, $227 | Made in Toronto, Canada, this handmade wall hanging is made from 100% natural cotton rope that the designer sources locally. 3. 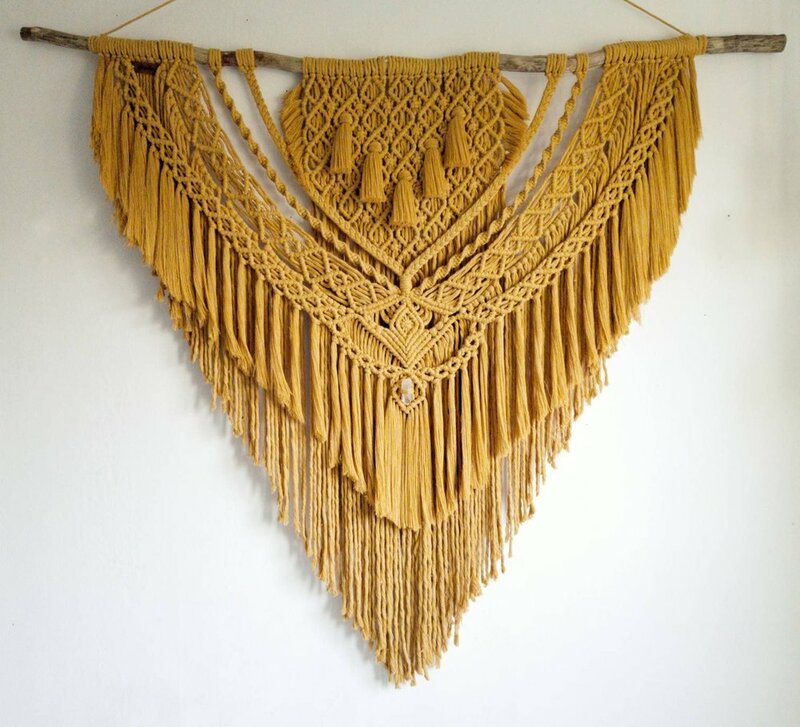 Macrame Wall Hanging by Dope Rope, $95 | This lovely organic-feeling, medium sized macrame piece is handmade from unbleached cotton in upstate New York using found branches from the woods in the area. 4. Lace by Liinala, €45 | This artist is based in Finland and is passionate about using recycled materials like yarn and cotton to make her eco-friendly fiber designs. 5. Shay by The Little Avocado, $68 | We love the neutral colors in this piece handmade in Echo Park, Los Angeles. This fiber artist also creates handwoven jewelry and macrame accessories.